Creaks and groans in the night remind guests that they might not be alone in Vermont's inns. Discover the history behind some of the Green Mountain State's spookiest places to spend the night. Loyal guest Mary Todd Lincoln enjoyed her annual respites at the Equinox Hotel in Manchester so much that death could not interrupt the tradition. Some still feel the presence of Al Capone in the underground bar he favored at Highgate Manor. The show goes on for the ghost of tap-dancing hero Boots Berry at Stowe's Green Mountain Inn. Queen City Ghostwalk creator and author Thea Lewis shares chilling encounters and examines the spirits of the past that are not quite resting in peace. 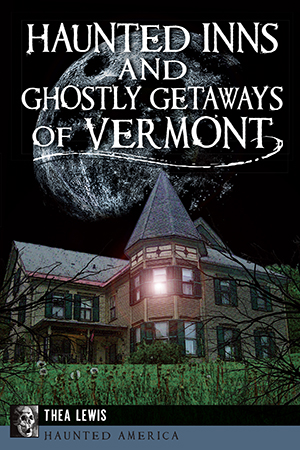 "Haunted Inns and Ghostly Getaways of Vermont" is the only bedtime story for a night in Vermont's eerie lodgings.